Why Are These 3 Wind Companies Excited About Obama's Clean Power Plan? There are bound to be numerous energy companies who'll benefit from Obama's plan -- wind companies are no different. SunEdison's Milford Wind Project in Utah. Source: SunEdison. The wind industry is just one of the many groups lauding Obama's recent Clean Power Plan, or CPP, as an important step in furthering America's adoption of renewable energy resources. Reducing the amount of carbon dioxide to 32% below the 2005 level by 2030 will result in a significant addition of wind capacity. Basing his information on that which was provided by the Energy Information Administration, Michael Goggin, Senior Director of Research for AWEA, finds that "wind accounts for 57 percent of the optimal energy mix to comply with the Clean Power Plan [...] Thanks to its combination of low cost and zero emissions, wind energy has the largest role in cost-effectively meeting the carbon rule." Let's take a look at how three wind power-related companies stand to benefit from the new policy. General Electric (NYSE:GE) might not look like the most obvious winner from Obama's CPP, but don't be fooled -- looks can be deceiving. In the second quarter of 2015, GE's turbines were used in five of the 12 completed utility-scale wind projects. Totaling 900 MW, GE's turbines represent 54% of the total installed capacity of the projects. The figures from the second quarter of 2015 suggest that GE's turbines will be appearing in many utility-scale projects to come. For the quarter, GE has wind turbine sales of 806 -- a 58% increase over the number it sold during the same period last year. This helped translate to an increase in revenue for the power and water segment, of which wind turbines are included. Totaling $3.4 billion, equipment revenue for the quarter was a 10% improvement over the previous quarter. The company has also seen improvement in its turbine sales year to date. For the first six months of 2015, GE has sold 1,278 turbines -- an 11% increase over the 1,156 it sold during the same period in 2014. Turbine orders also saw growth; the 888 orders it received is a 24% improvement over the same period last year. GE has other ways of benefiting from the advancement of the wind industry. In addition to supplying wind turbines, the company provides services and energy management solutions. According to the company, its Digital Wind Farm, "a dynamic, connected and adaptable wind energy ecosystem that pairs world-class turbines with the digital infrastructure for the wind industry," has the potential to increase wind farm productivity by 20% and "generate up to $50 billion for the wind industry." Renewable energy accounts for about 20% of GE's power and water segment. In orders for the second quarter, equipment accounted for $3.9 billion, and service accounted for the same -- $3.9 billion. Like GE, Vestas Wind Systems (NASDAQOTH:VWDRY) is a dominant force in the wind industry. This Danish wind turbine manufacturer, according to Navigant Research, was the No. 1 global supplier in 2014. Macho Springs in New Mexico. Source: Vestas Wind Systems A/S. Its presence in the U.S. market is no less -- for the second quarter of 2015, the company's turbines appeared in 36% of the above-mentioned utility-scale wind projects. Overall, Vestas has seen success in the U.S. market. For the first quarter of 2015, it reported orders totaling 341 MW, and it reported deliveries totaling 597 MW -- a 55% improvement over the 385 MW it delivered in the first quarter of 2014. The company is guiding for the rest of 2015 to be successful as well. It raised its estimated revenue for 2015 from a minimum of 6.5 billion euros to a minimum of 7.5 billion euros. It is also raised guidance on its free cash flow from a minimum 400 million euros to a minimum of 600 million euros. Providing services is also an integral part of the company's operations. For example, Vestas increased its service agreements with contractual future revenue 9% from the end of March 2014 to 7.5 billion euros at the end of March of this year. Regarding revenue from services in Q1 2015, Vestas earned 255 million euros -- a gain of 13% over the same period last year. Unlike GE and Vestas, SunEdison (NASDAQOTH:SUNEQ) is a company dedicated to the development of renewable energy projects -- projects that, oftentimes, are dropped down to the company's yieldco TerraForm Power (NASDAQ:TERP). Operating in the U.S. wind market for less than a year, SunEdison has made a concerted effort to grow its portfolio of projects. In January, SunEdison and TerraForm Power announced the closing of the acquisition of wind power project developer First Wind for $2.4 billion. In the deal, TerraForm Power purchased 500 MW of operating wind power plants. The company expects this to add $73 million in cash available for distribution, or CAFD, in 2015. SunEdison purchased the equity interests of First Wind and some of its subsidiaries. Several months later, in June, SunEdison and TerraForm Power announced the closing of the acquisition of Atlantic Power's 521 MW portfolio of operating wind power plants. The companies expect the acquisition to generate average annual CAFD of $44 million over the next 10 years. Continuing on their spending sprees, SunEdison and TerraForm Power announced the acquisition of 930 MW contracted wind power portfolio from Invenergy for $2 billion. The companies expect the portfolio to generate unlevered annual CAFD of $141 million. SunEdison, last week, demonstrated that its activity in the wind market is not relegated to billion-dollar acquisitions. The company announced that it had closed financing on $390 million in financing for a 300 MW wind farm in Texas. According to the press release, TerraForm Power expects to acquire the project once it's completed in 2016. For all of the enthusiasm the company exhibits in developing its wind assets, it doesn't address how it's going to manage its debt. Management's failure to be open and honest about its staggering debt and the stagnant cash from operations should give investors pause. SUNE Total Long Term Debt (Quarterly) data by YCharts. Wind power projects in the United States have become an increasingly viable option for utilities over the past few years. Now, with Obama's Clean Power Plan requirements, wind power may gain an even stronger foothold in America's energy future. And, while it does, GE and Vestas have a lot to gain. 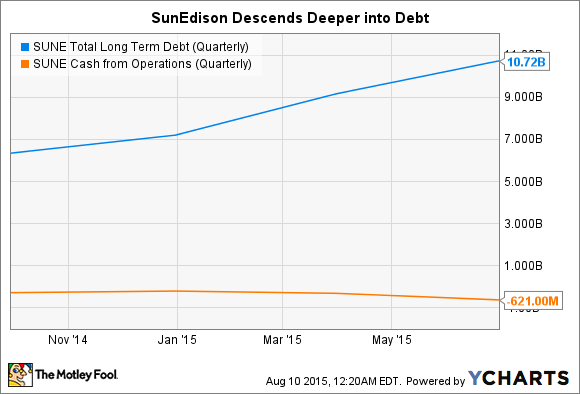 SunEdison may also prosper, but only if it is able to handle its staggering debt.